William Downey, known to most as “Bill” was born June 15, 1922 in Ottumwa, Iowa. His family moved to Chicago, Illinois where Downey attended elementary school and early high school. The family returned to Ottumwa following the death of his father. After graduating from high school, he enlisted in the Marine Corps to fight in World War II. In 1945, after leaving the Marine Corps, he returned to Iowa where he eventually owned and operated an auto repair shop in Des Moines, Iowa for over twenty years. In 1965, Downey and his wife visited Santa Barbara and relocated to the community the following year. During this time his wife encouraged him to begin his writing career. Having only a high school education, Downey set out to start a career in journalism. Although he was in his 40’s, it was obvious that he had a natural talent for writing after he published a three-part story about the African-American Muslims in Santa Barbara. The article caught the attention of the Santa Barbara News Press and Downey became its first African-American reporter. He worked his way up from writing obituaries to a feature-story writer. Downey was famous for his “Gone Fishin” columns, which often featured a colorful character “Uncle Russell.” He also published feature articles in Better Homes & Gardens in Des Moines Iowa, Western Outdoor News, American Shootgunner and Outdoor Life. Downey’s career changed after he wrote an article about a boy who was dying of leukemia. Newspapers from around the world picked up the article. He expanded the article into a story and sold the movie rights. The proceeds afforded Downey the opportunity to end his fourteen-year career at the Santa Barbara News Press. After leaving the News Press, Downey invested more time writing novels and teaching. Downey was well respected in the literary community for his work with the Santa Barbara Writers Conference and his writing classes through adult education and UCSB Extension. He was a member of Outdoor Writers of California, Pillsbury Foundation Writing Committee, Adult Education Instructor’s Association, and Santa Barbara Continuing Education Association. Downey was the author of the five novels which include, Tom Bass: Black Horseman, Black Viking, Uncle Sam Must be Losing the War, EDOU, and Right Brain: Write On! William Downey died on September 1, 1994. It has been over four decades since the Japanese attack on Pearl Harbor plunged this country into three years of bitter warfare. Many who served in that war have written of their experiences and perspectives, and this book by Bill Downey will rank high among the accounts of the United States marines. By September of 1942, the United States Marines were the last military Service to accept black volunteers. Few Americans realized this, and average white Marines were as surprised as anyone else to find blacks wearing dress greens. Here, one of those first black United States Marines tells the candid story of their early training and experiences. It is a gripping testimony whose biting humor etches the way it really was. It all began when Commander-in-Chief Franklin Delano Roosevelt ordered the Marine Corps to organize and train a unit of black volunteers—which was done, albeit grudgingly. And America’s first black Marines emerged at a time when most public facilities throughout the south and much of the north, such as toilets, drinking fountains, stores, theaters, hotels, buses, trains, and depots, were rigidly segregated. For these reasons alone, it had to be remarkable that several hundred young black men of good education, background and moral character would exhibit such a patriotic commitment as to enlist in a branch of service where they were previous unaccepted and were still not welcomed. 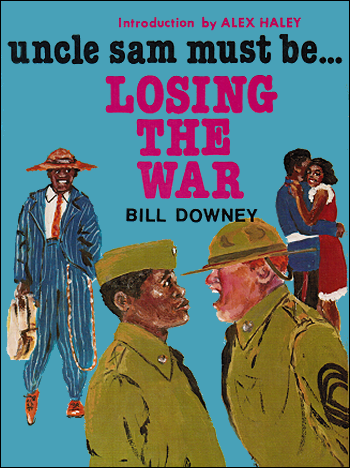 Uncle Sam Must Be Losing The War focuses upon author Bill Downey as one of those idealistic young blacks who was eager to serve his country and joined the Unites States Marines. We see him eventually return home regarding himself as a survivor. Bill’s story is in many aspects the experiences of the more than 15,000 black Marines who followed later. ~ Alex Haley, Beverly Hills, California 1982.